So... I love makeup brushes. Like I really, really love them. Because my collection is ridiculous and a full brush cleaning takes me a couple of hours, I've been really good for quite a while about picking up more brushes. I decided a while ago that if I was going to get more brushes, I was going to have to do a cull of my current collection first. 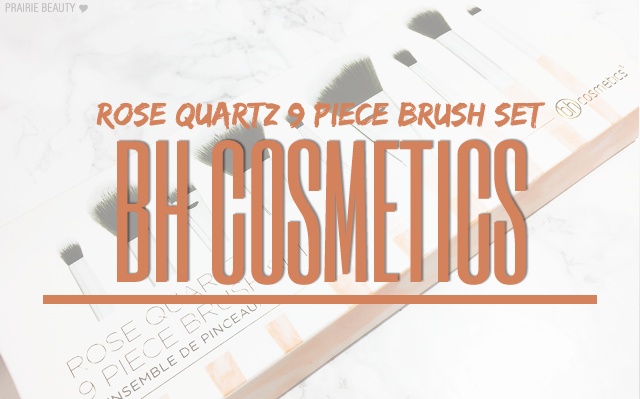 However, when I first saw a photo of the bh Cosmetics Rose Quartz 9 Piece Brush Set, I pretty much immediately decided that I had to have it... and then a few days later, after forcing myself not to impulse buy, I still wanted it so I just decided to go for it. 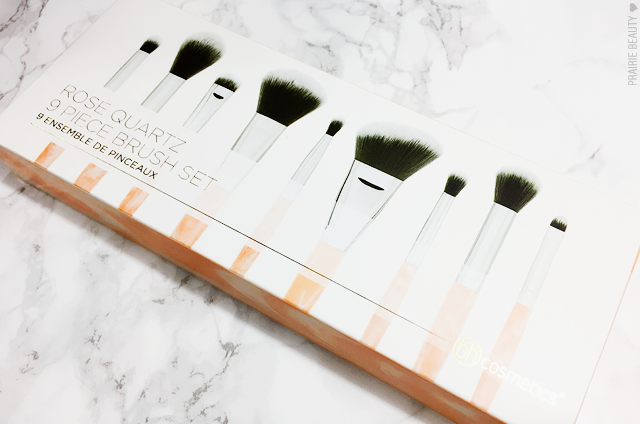 Now that I've been putting these brushes to work, I've got a full review! Keep reading! 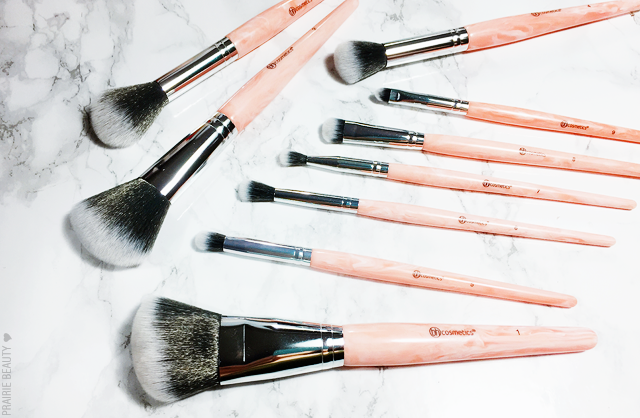 Add a romantic accent to your makeup table with our Rose Quartz 9 Piece Makeup Brush Set, a collection of face and eye brushes featuring marbleized pink handles and soft synthetic bristles. 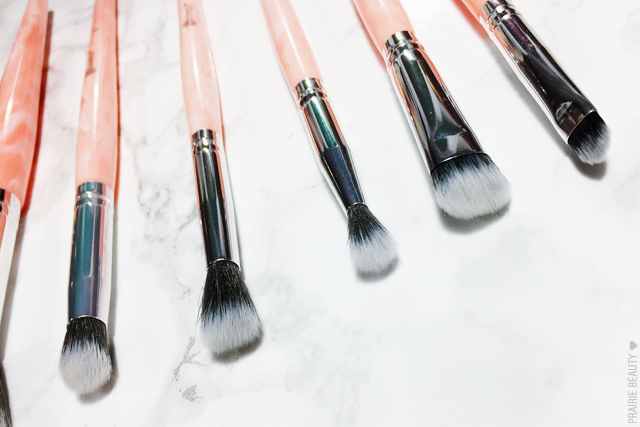 These versatile brushes allow you to achieve flawless, professional-looking makeup application every time. There were really two things about this brush set that appealed to me. The first was the obvious.... How pretty is this set! I love the marbled peach of the handles and the way they taper in a way that makes me think of a paint brush rather than most of the other brushes in my collection. The charcoal grey and white two tone fibres are also really, really pretty. The second thing that appealed to me about these brushes, however, is that I really felt like there were a good number of brushes in this collection that I didn't have dupes of in my collection already. I think they managed to put together a set that has the brush styles that you need, but with enough uniqueness that it makes them different. For me, that's really the thing that sold me, because I could better justify buying a set of brushes that would bring something different to my collection. For me, this is a perfect brush for applying bronzer to the contours of my face. Personally, I'm much more likely to softly sculpt my face using bronzer rather than sharply contour, so that's much more preferable anyway. While I do really like this brush, I find myself wishing it were a little bit more dense because the bristles are so soft that I find I have to dig into the product a little bit to pick it up. Still, good brush and one of my more used from this set. For me, this is definitely the throwaway brush from this set, simply because it's not unique and not the type of brush I personally prefer. It's a little too big for blush for me, but a little too small for powder, and it could also use a little bit more density overall. It's a nice brush, but not my personal favorite. This was one of the more exciting brushes for me when I first ordered this set and I'm overall really, really happy with it. I don't think this will be the kind of highlighter brush that someone who likes a really sharp, bright highlight would enjoy because it's quite soft and fluffy and gives a lighter wash on the skin. For me, though, that's perfect. If I had one critique it would be like that I would like this to be just a bit shorter so that it didn't bend quite so much. I honestly didn't think this brush was going to be very exciting to me... but I could not have been more wrong! I think this is actually my favorite in the collection because it's perfection for blending out concealer as well as getting into tighter spaces on my face, like around my nose, to make sure nothing is caking up. Lovelovelovelove. 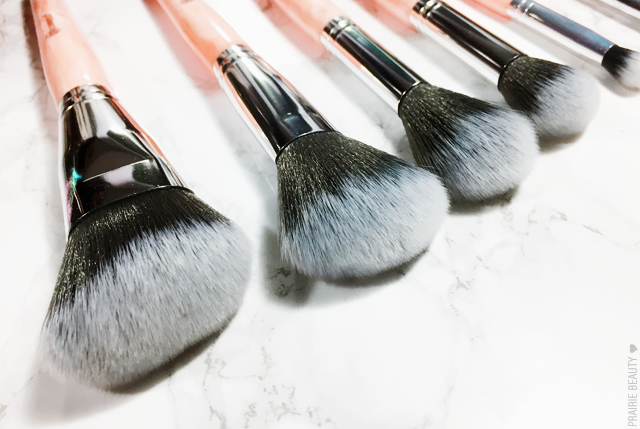 This is one brush where that softness of the bristles really works, because it gives that airbrushed finish on the skin. The domed shape and density of this brush are perfect for really packing colour into the crease and I find that I can get a good amount of depth using this brush. I do wish it went either a little bit more fluffy or a little bit more dense, because I feel like it sits in the middle somewhere and would be a little bit better if it went one way or the other. Still, I do think this is a good brush and it's one of the ones I've been using most. As a matter of preference, this isn't my personal favorite brush, but I do think a lot of people would really love it. Personally, I would prefer that the bristles either be a little bit shorter or a little bit more fluffy, because I feel like they're a little too long to be so narrow. Am I even making sense with this? I think this is a usable brush, and like I said, I think a lot of people would really like it. I just personally prefer a different style of blending brush. This is another brush that sold me on this set and has 100% won me over. Because this brush is TINY, I feel like I can add depth to the crease and also smoke out the lower lash line without making a mess. The best thing, for me, about this brush is that the dimensions are perfect. It's the right length and density for the job that it's doing. One thing that I really like about this brush is that it tapers a little bit at the tip, so even though it's quite a big brush I feel like I can be fairly precise with it. I've been using this one to pack on lid shade really consistently and I think it does a really good job. For someone with a really small amount of lid space, this might be too big, but I think it works really well. It also has the right amount of density so I can both wash shadow over the lid and also pack it on heavily. Honestly, I didn't really know what I was going to do with this brush until one day when I needed to smudge out some pencil eyeliner and I decided to give it a try. This isn't going to pull out a sharp wing like an angled brush will, but I do think it does a nice job of creating a smooth blend on eyeliner. I also feel like this would be a phenomenal brush for applying glitter, because it's really firm, small, and pointed so you could get a really precision application. I think that the quality of these brushes is consistently really good. 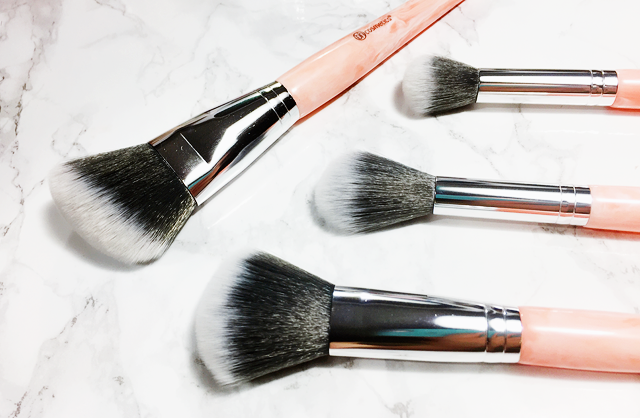 They feel like well made, sturdy brushes that aren't going to fall apart at a moment's notice. 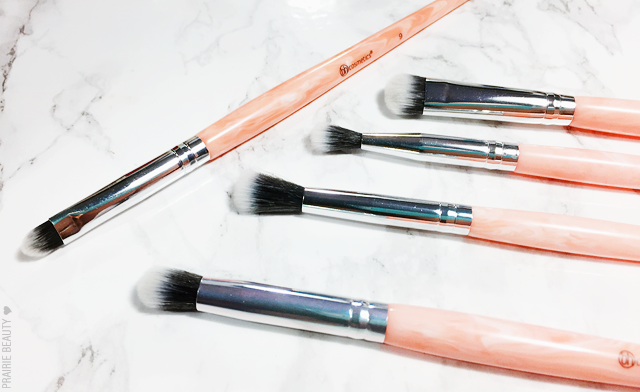 I've actually owned bh Cosmetics brushes from another set and they've also held up really, really well, and I think these ones feel even higher quality. I've only washed these brushes once so far, but I didn't notice any shedding when washing and I found that they cleaned really easily and dried quite quickly. Because all of the bristles are so soft, I found that it was easy to get really get the brush cleanser in there and also really easy to rinse them out completely. Also, because these are synthetic bristles, I think they'll definitely retain their softness for a long time. Overall, I do think there are some tweaks that I would personally make in this brush set to make it perfect for me, but I still think it's a great set and one that I will really get use out of. And even if I didn't... It's so pretty that I love having it on my vanity. My favorite brushes are definitely the ones that are different from anything I already have in my collection. I think the Tapered Highlight Brush, the Deluxe Blending Brush, and the Precision Crease Brush make this palette 100% worth it to me personally all on their own. 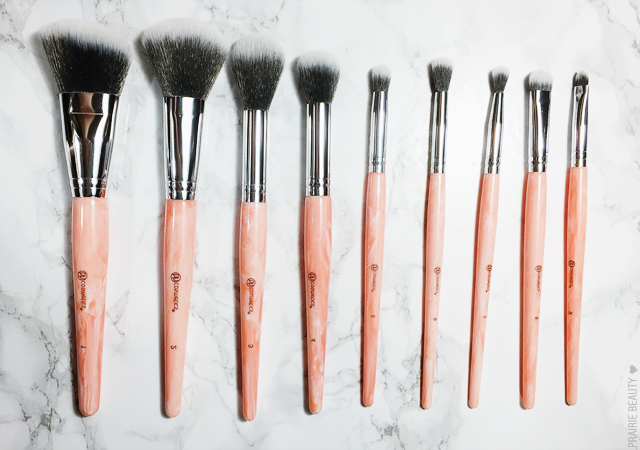 The bh Cosmetics Rose Quartz 9 Piece Brush Set is available on their website for $17.50US, but like almost everything bh Cosmetics sells it's frequently discounted - and don't forget to use eBates! I'd love to see your photos or reviews if you decide to pick this up, so let me know in the comments!